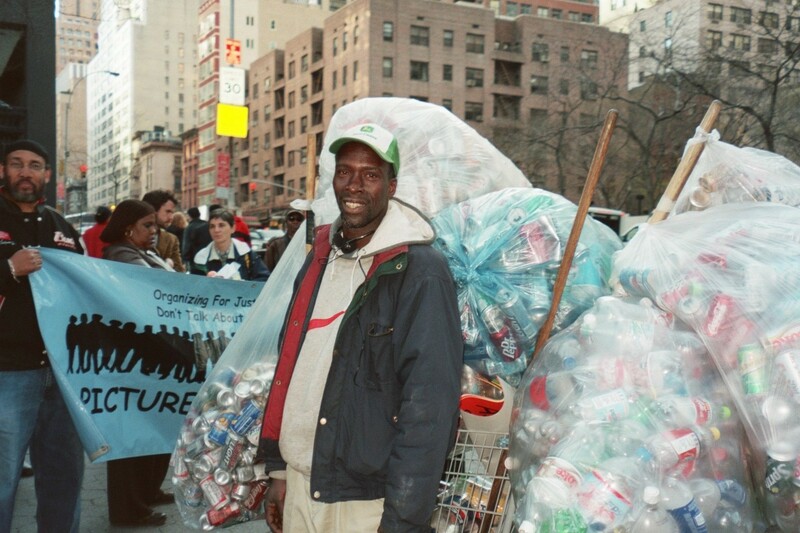 Canner’s Campaign leader Eugene Gadsden at a 2005 protest of supermarkets that violate the New York State Bottle Bill. The difference between the cost of renting an apartment or a room, and how much money poor folks have in their pockets, is the biggest determining factor in the ever increasing numbers of homeless New Yorkers over the past 30 years. Many members of Picture the Homeless are subsistence workers: street vendors, day laborers and canners. Many of them describe how, back in the day, they could rent a room with the income from canning or other subsistence work. Today, they are squeezed out of even the cheapest end of the housing market. Canners pick up the discarded cans and bottles that the New York State Bottle Bill requires vendors to accept: basically carbonated beverages like beer and soda. Gentrification has led to the closing of the large redemption centers below 125th Street in Manhattan, where canners used to be able to cash in unlimited quantities of cans and bottles, forcing canners to cash in at supermarkets and small stores. If a store sells the product (like Pepsi), they are required by the NYS Bottle Bill to accept empties in exchange for the 5 cent deposit – up to 240 per day per canner. By law canners can redeem up to $12.00 of cans or bottles at each store, but they are forced to push their loads long distances, often in shopping carts, from store to store, to cash in their empties. Canning is hard work. Canners often work 12 hours a day or more, combing through public trash bins and curbside recycling and picking up litter. Most shelters won’t allow them to bring in their carts, so they’re are forced to spend the night sleeping outside with the day’s collection, waiting for the supermarket or redemption center to open in the morning, or to take their massive carts on subways and risk hostility from police and other riders. Many of our members identified police harassment of canners and the refusal of supermarkets and other stores to allow them to redeem their empties as major issues impacting their ability to earn a living. The indignity of store violating the law and refusing to allow canners to cash in their cans was a catalyst behind our Canners campaign. The Picture the Homeless canners campaign won the support of the Department of Environmental Conservation and then New York State Attorney General Eliot Spitzer in our fight to force supermarkets to comply with the Bottle Bill. We partnered with the canners group at St. Mary’s Church, the Redeemers. We utilized multiple strategies – including outreach, know your rights training, direct action, documentation and participatory research – identifying the three top offending supermarkets that violated the NYS Bottle Bill. One store manager actually stated to Picture the Homeless over the phone, “these people are crack heads and have diseases and I have children – do you want me to take some disease home to them?” when confronted by Jean Rice back in 2001. Pressure from the Attorney General’s office led to greater compliance of supermarkets. In 2009 we were part of the state-wide alliance that passed the Bigger Better Bottle Bill. Bottled water now carries a deposit, which greatly expands the amount of money that canners can make, and there are no longer limits to the number of cans and bottles a supermarket will redeem. A successful ongoing offshoot of our canners campaign was the formation of a cooperative endeavor run by canners in Brooklyn, led by PTH leader Eugene Gadson, that evolved into a canners run not- for- profit organization, Sure We Can.